Wet Day On Track Gives Davies Even More Confidence—As all his main rivals were either absent or simply not riding in the heavy wet conditions on the second day of private testing at Motorland Aragon, Chaz Davies took the chance to get used to his all-new Panigale V4R. He was pleased with the result almost as much as he had been in the fully dry conditions of day one. There’s much work to be done, but Davies knows the base Panigale V4 R is a solid machine. Like most of his peers, Davies will test near the end of November, at Jerez – which is back on the 2019 WorldSBK calendar as well. 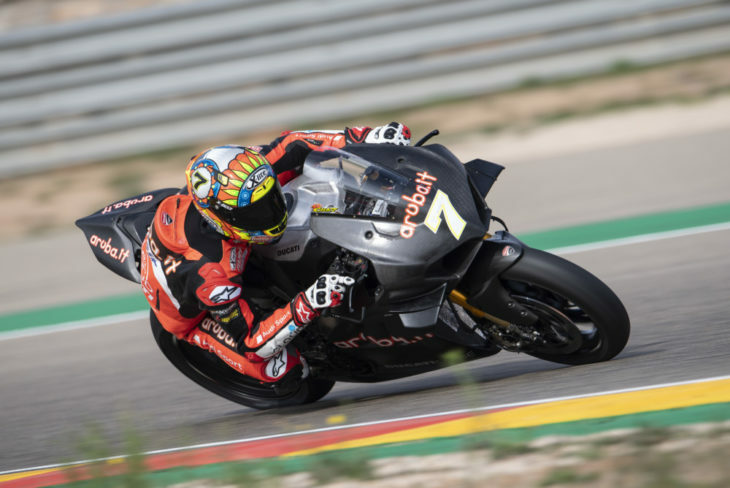 At the other Spanish track to be used in 2019 – Motorland Aragon – Davies did not get to try out Öhlins’ new WorldSBK spec front forks, that will be used by all in the forthcoming season. With his new 2019 official Ducati team-mate Alvaro Bautista heading to Valencia for the final GP of the season, just as Davies was riding his new bike as much as he could 250km further north at Motorland, Davies was asked what he expected from the latest former MotoGP rider to join the WorldSBK paddock. Davies also thinks that Bautista will be a good litmus test for WorldSBK in general, and some people’s idea of where the level of the series is. Especially those in MotoGP for whom WorldSBK is was and always will be way down the scale.